Discussion in 'Supporting Retailers' started by PuffItUp, Jul 24, 2011. Glad you like the SAI. I have been using the TAF with a quartz bucket as my every day carry. and better than ever. I can use same TCR#s & just change temps , very nice. I took the quartz bucket and used it in my molecule. and now the ti bucket on the quartz heater. It's like playing with legos haha. Yep I hear you, lol. Try Donut heater under Quartz Cup. Thanks for getting the life sabers back in stock and nice to see the nano's are back also. Are the nano's cords the old or new ones? Great price & free ship with the new hot Saionara Quartz Cups. & Ti Skillet atty's & for getting them out so quickly for my weekend. Vapor_Eyes, arb and PuffItUp like this. Vapor_Eyes, arb and tennisguru1 like this. I just got the best customer service I have ever received. Hands down above and beyond all expectations I am impressed and touched by the professionalism and concern for my well being shown by this company and the people working there. Thanks Alice you made mrs arb cry good tears and we appreciated it immensely. Vapor_Eyes, doubledown, Helios and 6 others like this. Vapor_Eyes, Whisper, myla and 5 others like this. Sai TaF Buckets, you guy & gals ROCK!!! Vapor_Eyes, KidFated. and His_Highness like this. Very nice package from PIU today!! I ordered on Thanksgiving day and it would have been here yesterday if not for the snowstorm. That is one reason I love ordering from them. So consistent, never have to sweat it. Great candy too!! Thanks Allyson!! Vapor_Eyes, doubledown, tennisguru1 and 5 others like this. The candy makes it all so sweet. Vapor_Eyes, His_Highness, tennisguru1 and 2 others like this. PIU again comes through for me. Quick. Great packing by alyson(?). And did I say quick. I got arizer solo original. What a great vaporizer and such a bargain. Vapor_Eyes, KidFated., arb and 3 others like this. I ordered a few things on Thanksgiving and had them in my hands by Monday. You guys always bring it home quickly! Vapor_Eyes, KidFated., arb and 2 others like this. Podfitup. A fun company. Love their candy! Vapor_Eyes, SSVUN~YAH, KidFated. and 3 others like this. I'll chime in here. I bought the SLX grinder during their BFS sale and not only was it my first BFS item to arrive, its the only one to have arrived! 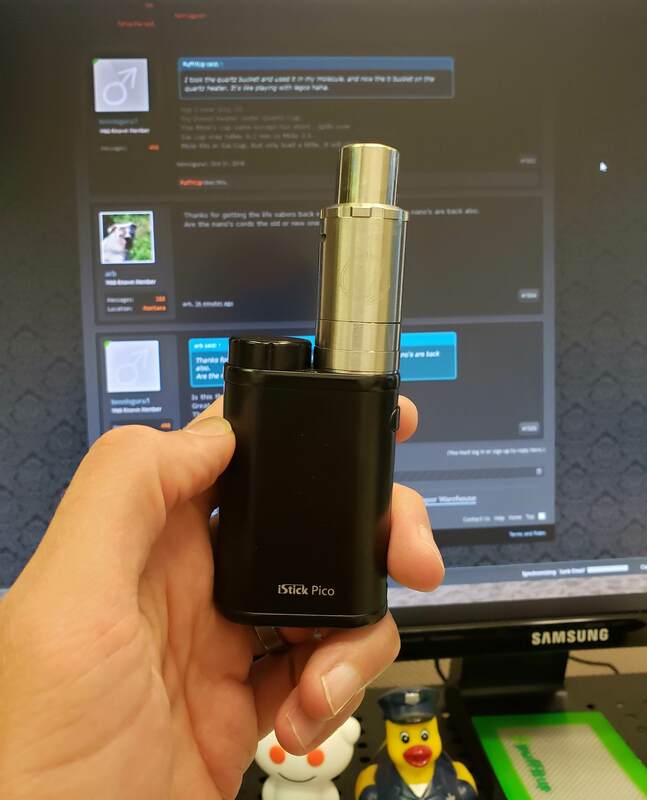 Previously, I received a bad stem for my Arizer Air from @PuffItUp and contacted them regarding replacement. Randy got in touch the same day and after sending over a photo of the stem he confirmed replacement. The whole request took about 30 minutes in a world where these things can be strung out over weeks. Thanks Randy. Whisper, Vapor_Eyes, Ramahs and 7 others like this. joekar, myla, MonsterWithoutBorders and 4 others like this. Got my Vote!!! I would not shop anywhere else if they carried what I needed. So guys & gals , Carry More Stuff LoL :>) So we can buy more from PuffitUP!!! Can you peeps get the 5 pack of donut heaterts W/O Ti buckets? Why do we have to shop at HVT, when I want candy from Allie? I wish for you in 2019 the most Successful, Healthiest & Happiest Year of your Life. Vapor_Eyes, Summer and arb like this. Betty White, Vapor_Eyes, myla and 8 others like this. You are right. V goodiez was nice enough to point out some errors this morning that we are correcting now. Thanks for the heads up! Vapor_Eyes, kbrown5523, myla and 7 others like this. When are you getting the 2019 ss dynatips in stock? PuffItUp, SSVUN~YAH and muunch like this. They are in our warehouse right now but i don't believe we are allowed to ship anything until the 1st. Vapor_Eyes, kbrown5523, His_Highness and 6 others like this. That is what I call being on the ball..........one of the many reasons I like doing bidness with you fine people. Vapor_Eyes, Catweasel, kbrown5523 and 7 others like this. Holy crap look at this thing! I don't see it on the sticky brick store, is this exclusive to you guys? I love this store so I'm not complaining, just wondering. I want to see it compared to their OG. Is there a thread for this on the forum? Vapor_Eyes, SSVUN~YAH, Ramahs and 2 others like this.